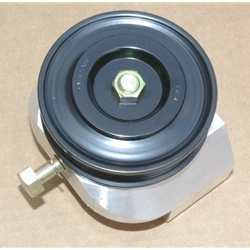 This kit includes mounting block and an OEM Nissan idler pulley. Mounted in place of the factory pump, still allows tension adjustment of the waterpump. Block is a beautiful machined billet aluminum piece. ** Belt suggestion is a K040292.